I’m glad to announce that the AWS Lambda plugin in the AWS Toolkit for Eclipse now supports serverless application development for Java. The serverless application (also called a Lambda-based application) is composed of functions triggered by events. 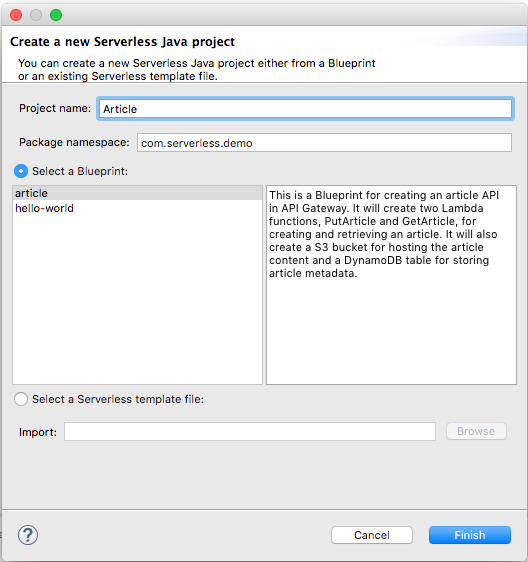 In this blog, I provide two examples to show you how to leverage the Eclipse IDE to create and deploy a serverless application quickly. 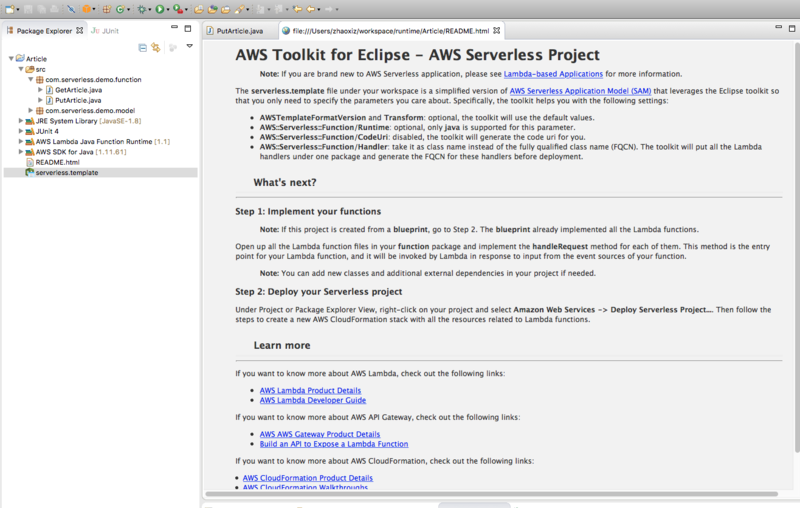 To install the latest AWS Toolkit for Eclipse, go to this page and follow the instructions at the top right of the page. You should install the AWS Toolkit for Eclipse Core, AWS CloudFormation Tool, and AWS Lambda Plugin to use this feature. The following figure shows where you can choose these three components in the installation wizard. 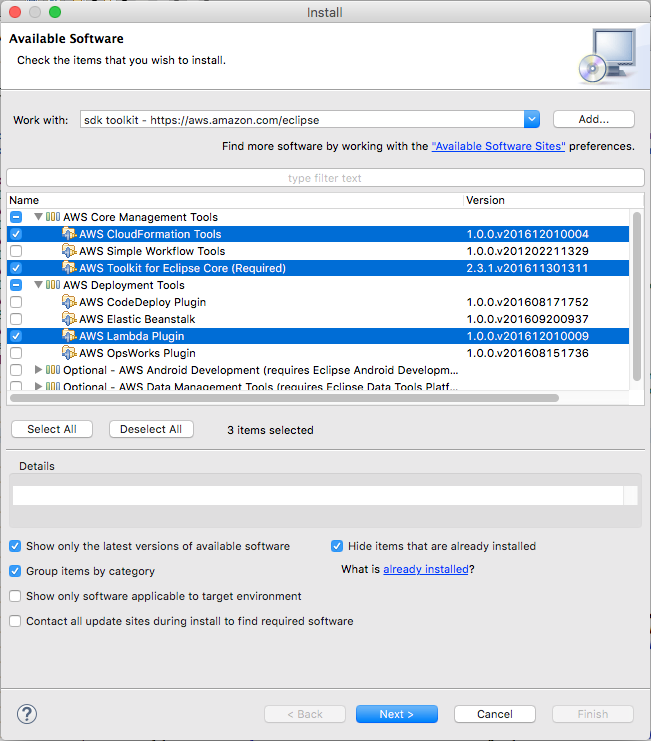 To complete the installation, you need to review and accept the license and restart Eclipse. To create a serverless project, click the Toolbar AWS and choose New AWS Serverless Project…, The following wizard opens. You can also create a new serverless project using the AWS Toolkit for Eclipse in the usual way: Choose File, New, Other, AWS and then choose AWS Serverless Java Project. As you can see in the following figure, the Toolkit provides two blueprints for you to start with: article and hello-world. 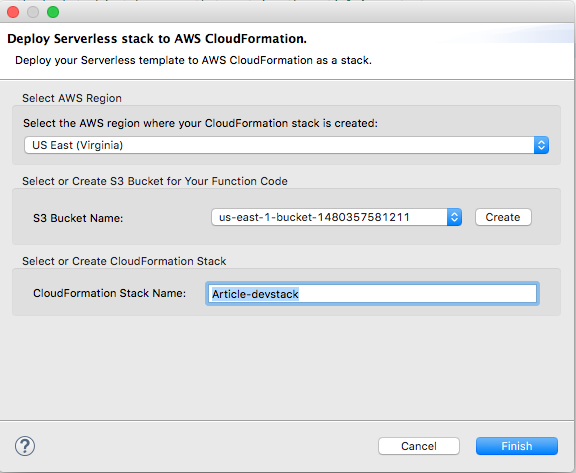 article – This is a simple serverless application that helps manage articles. It consists of two Lambda functions triggered by API events. The two functions are GetArticle and PutArticle, which manage storing articles to the backend service and retrieving articles to the front end. This blueprint also leverages an Amazon S3 bucket for storing article content and an Amazon DynamoDB table for storing article metadata. hello-world – This blueprint project only includes a simple stand alone Lambda function, HelloWorld, which is not triggered by any event and not bound to any resource. It simply takes in a String and outputs it with the prefix “Hello”. If an empty String is provided, it outputs “Hello World”. You can also use a serverless template to create a serverless project by choosing Select a Serverless template file and then importing the template file. This template file is a simplified version of the SAM (AWS Serverless Application Model) file that is used in a serverless application to define the application resources stack. The following snippet is from the blueprint articles template for defining the Lambda function GetArticle. Different from the real SAM file, you don’t need to provide the CodeUri and Runtime properties, and you only need to provide the class name for the Handler property instead of the Fully Qualified Class Name. By importing a template file, the AWS Toolkit for Eclipse will generate all the Lambda function hooks and the Lambda Proxy Integration models used as the API event Input and Output for the Lambda functions. The following figure shows the startup view after you create the article blueprint project. As you can see from the project structure, the AWS Toolkit for Eclipse puts all the Lambda functions defined in the template into a function package, and all the required models into a model package. You can check the serverless.template file for a closer look at this project. As we mentioned earlier, this is a simplified version of a SAM file, which is derived from AWS CloudFormation template. See the README.html page for the next. If the serverless project is created from a blueprint, you can deploy it directly to AWS. Notice that the article blueprint will create an S3 bucket and a DynamoDB table for use of the Lambda functions. You can open the serverless.template file and customize the resource names in the Parameters property section, as shown in the following snippet. To deploy this project to AWS, click the project name in the explorer view, choose Amazon Web Services, and then choose Deploy Serverless Project. Or right click the workspace of any Lambda function file, choose AWS Lambda, and then choose Deploy Serverless Project. You will see the following wizard. Choose the S3 bucket, type the CloudFormation stack name, and then choose Finish. The AWS Toolkit for Eclipse generates the fat JAR file for the underlying Lambda functions, and uploads it to the S3 bucket you chose. It’ll also update the serverless.template file in memory to be a real SAM file and upload it to the S3 bucket. AWS CloudFormation reads this file to create the stack. 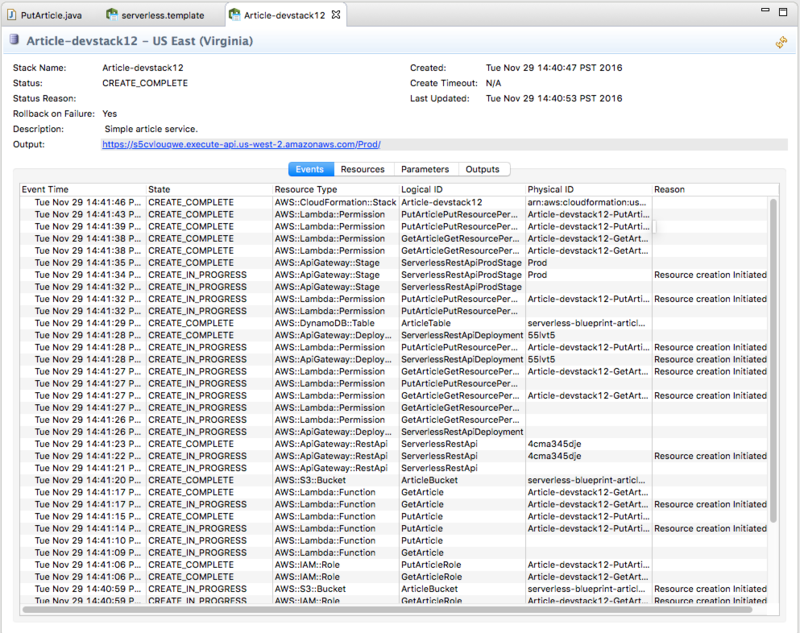 While the AWS CloudFormation stack is being created, a Stack Editor view is shown to indicate the current status of the stack. This page is automatically refreshed every five seconds, but you can also manually refresh it by clicking the refresh icon at the top right of the view. Upon CREATE_COMPLETE, you will see a link to the right of the Output label in the top section. This link is the Prod stage endpoint of the API Gateway API created by this serverless project. After successfully deploying the article project, you can test the two APIs by hitting the API Prod endpoint through browser tools or command line tools. Using the Curl command line tool. Using the Simple rest client plugin in Chrome. You can also use this plugin to send a POST request to the endpoint. We’d like to know what you think of the workflow for developing serverless applications with the AWS Toolkit for Eclipse. Please let us know if there are other features you want to see in this toolkit. We appreciate your comments.